Apple on Wednesday released OS X Yosemite version 10.10.3, bringing with it the company's long-promised Photos app, as well as a collection of bug fixes and security improvements. Photos replaces iPhoto and Aperture, organizing images and video while providing some basic image editing functions. Users can browse media in Moments, Collections, and Years views, as well as Photos, Shared, Albums, and Projects tabs. That content can also be uploaded to iCloud Photo Library in full resolution. Photobooks can be composed using simplified tools as well as newly-added themes. New square book formats are included as well, and users can buy prints through the app in extra square and panoramic formats. 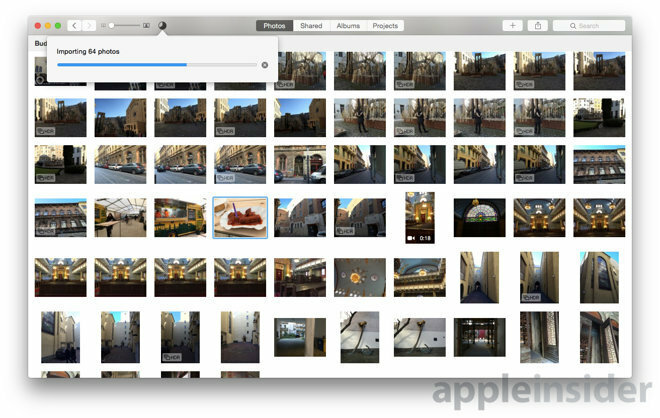 iCloud Photo Library has also exited beta, making it possible to browse a personal photo collection from any device running OS X Yosemite or iOS 8, as well as iCloud.com. The service is also designed to make it easier to share photos and videos, and even allows any person with access to a shared album to make comments. For software developers the update contains application programming interfaces needed to support the Force Touch functions of the new 13-inch MacBook Pro and the upcoming 12-inch MacBook. Other improvements include 300 new emoji, among them ones with different skin tones, and the addition of Spotlight suggestions for the Look Up panel. Bugfixes deal with problems like Wi-Fi performance and captive network compatibility, Bluetooth devices disconnecting, and the reliability of screen sharing. Safari should have better stability and security, and no longer save website favicon URLs used in Private Browsing mode. OS X 10.10.3 can be downloaded via the Updates tab in the Mac App Store app.